"The Ultimate Component Sports Car!" Build a SUPERCAR not Replicar! Dragons turn heads wherever they go. Here are a few notable Dragon accomplishments in the past year or so. August 2009 Paul takes over as sole owner of Dragon Motor Cars, continuing to offer SeriesI, SeriesII, and now the Long Wheel Base SeriesII Option for C5 Suspension. July 2009 Despite slow economy, SeriesII sales continue with delivery of a roller to Don Gindelberger of IN. October 2008 Paul's Blue Dragon wins Auto-cross and Road Course and Drags (time of 12.783) for Overall Champion in Small Block Street Class!!! Brett Lenger's Turbo S-II and Brian White's "'07 Best in Show" S-II also raced. July 2008 Brian White wins Good Guys Auto Cross in Kansas City in his Candy Tangerine SeriesII, with Brett as a passenger!! June 2008 First Dragon delivery to Canada. Terry Fletcher starts his build of a C5 Super T-Bucket. Blue Dragon and restored Ruby help lock in top three Street Road Course times. Summer 2007 Melody Thompson's #11 SeriesI Dragon wins 13 show awards, including big win at Councourse of Serrano. May 2007 First public display of C5 Super T-Bucket at Carlisle Kit Car Nationals. Cobra is a registered trademark of Ford Motor Company. Corvette, Camaro, & Firebird are trademarks of General Motors Corporation. 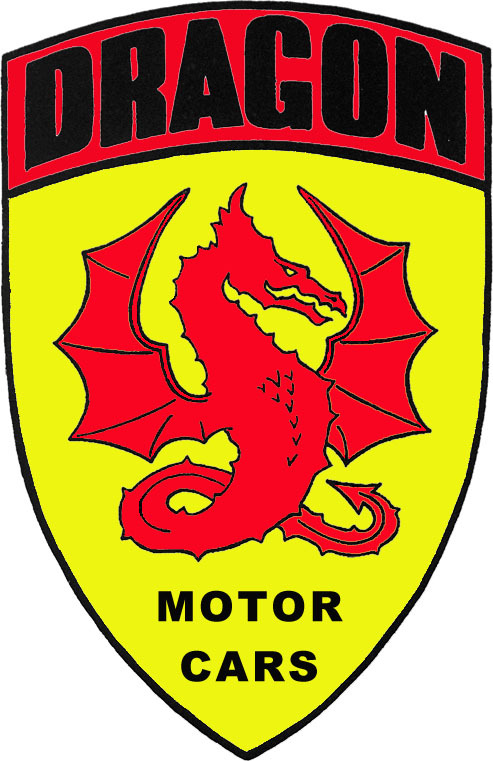 Dragon Motor Cars, LLC. is not associated with Ford or GM.